Today, it’s Thea’s turn with a review of Keeper of the Isis Light by Monica Hughes! Olwen Pendennis is the Keeper of the Isis Light. She and her companion, Guardian, have lived alone on the planet Isis since the death of her parents. But then a group of colonists arrives on Isis from Earth, settling in the valleys – the only places where they can breathe and not be harmed by the planet’s harsh sun. Olwen fears these new inhabitants may ruin her world forever, and at first, it appears she is right. Why did I read this book: I recently read and loved Monica Hughes’ Invitation to the Game, so when I spotted this (omnibus edition) at my local indie bookstore, I greedily and immediately snatched it up. A classic 1980s YA science fiction novel, from an author whose work I’ve already thoroughly enjoyed? YES PLEASE. On the eve of Olwen’s tenth birthday (or her sixteenth, in Earth years), things couldn’t be more blissful. The sole keeper of distant planet Isis, Olwen cannot remember her parents or her past, but she wants for nothing – after all, she has a beautiful world to call her own, a loyal pet named Hobbit for companionship, and, most importantly, her beloved Guardian to help guide her in all her decisions and in her work. Olwen’s role on Isis is that of the Keeper of the Light, responsible for making sure that the beacon of information about Isis leaves the planet and is beamed into the vastness of space. There, the signal from the distant second-tier planet will aid nearby supply ships and deep space travelers. On Olwen’s birthday, however, the vastness of space sends back a message to the Keeper of the Light – at long last, colonists from Earth are coming to claim Isis as their new home. The arrival of the eighty human colonists of varying ages and backgrounds is terrifying yet exhilarating for young Olwen, who has never seen another human before in her life. As the new colonists settle in and begin to establish their new settlements in the oxygen-heavy, radiation-protected valley (far below Olwen’s home atop the mesa where she and Guardian live to tend to the Light), it becomes clear to Olwen that she is different. These outsiders start ruining her valley with their machines, and refuse to come up to her eyrie for fear of the thin oxygen and dangerous radiation from the light of Isis’ sun, Ra. Worse, because Olwen has lived in isolation from all other humans for her entire life, Guardian makes her wear a protective suit around the colonists at all times, shielding her from dangerous microbes, but also keeping her hidden and separate. There is one colonist, however, who immediately tries to befriend Olwen – a seventeen year old (by Earth years) boy named Mark, who is fascinated by the mysterious Olwen behind her plastic shield. As the relationship between Olwen and Mark grows, the differences between the young woman and the new colonists becomes an impossible chasm to bridge – for Olwen is far more different from her Earther brethren than anyone could ever predict. Let me kick off this review by saying: holy crap, people. I loved this book. I loved it. 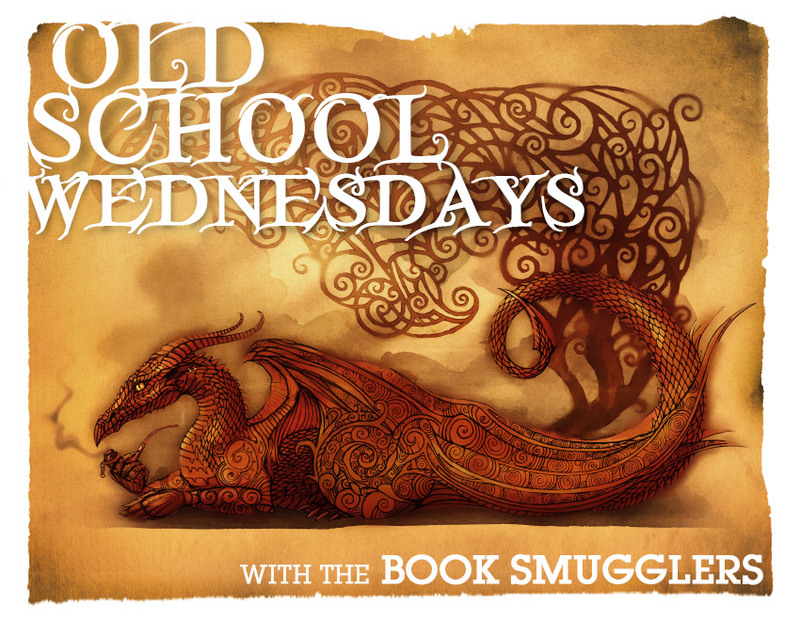 I’m shocked that I’d never heard of this series before because it is precisely the kind of book I would have loved as a tween/teen, and exactly the kind of hidden gem Ana and I always hope to unearth with these Old School Wednesday reads. Books like Keeper of the Isis Light are the reason we have this feature! At the risk of sounding like a gushing moron, I’ll say it again: I loved this book. Originally published in 1980, Keeper of the Isis Light is traditional, eco-conscious quietly subversive science fiction. Its of that breed of 80s and 90s YA sci-fi that reads quickly and appeals to eager young minds, while simultaneously questioning and provoking established topical themes. 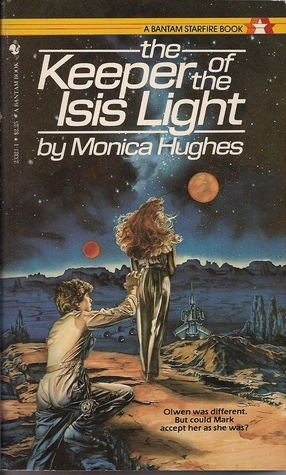 Like Jane Yolen or Lois Lowry, Christopher Pike or Bruce Coville, Vivian Van Velde or William Sleator, Monica Hughes’ first Isis book has that same potent blend of nostalgic and slightly dated technology (what was cool and futuristic in the 1980s – i.e. hypno-stasis and hypnotic suggestion, in the case of this book – is not quite en vogue today), and timeless thought-provoking questions of humanity, choice, and identity. In this novel, we see through the eyes of Olwen, who has wanted for nothing all of her years on Isis. She’s never lonely because she has a beautiful home, a friend in Hobbit, and love for her Guardian. Orphaned at a very young age, Olwen has never known anything else – and the catalyst of the arriving Earthers, with their old ways, prejudices, and social conditioning presents a complex puzzle for Olwen, who cannot understand the colonists’ ways of thinking and being. At the same time, the colonists can hardly imagine how Olwen has survived on a planet all alone for her entire life – that is, the culture gap between the two parties is immense. Of course, there’s a larger issue that separates Olwen and her new neighbors – but therein lie spoilers. Suffice it to say that Olwen’s differences extend beyond her upbringing, and the best, most potent thing about Keeper of the Isis Light is how it challenges ideas of humanity, prejudice and identity. I will say that Keeper of the Isis Light is very much a product of its time, which is both good and bad. For example, while Olwen is defined and (to me) a wonderfully expressive heroine, the other characters in the text don’t really see as much care or development (I wish we could have spent more time with Guardian, for example – but I suspect we’ll see more of this particular character in the next book). On the positive side, like many of the YA SFF novels of earlier decades, Keeper of the Isis Light does NOT incorporate a happily ever after romance (a feature that seems to be a mandatory requirement of most current YA SFF). I love that this is actually a melancholy book, that problems aren’t dissolved with an aww-shucks shrug and handshake – the prejudices and differences that divide Olwen from the colonists are not things that easily disappear, and I love and respect the sadness and reality of the book’s conclusion. In sum: I loved this book, and I cannot wait to read the next two installments in the Isis trilogy. Absolutely, wholeheartedly, emphatically recommended – one of my notable reads of the year, hands down. This sounds like something I would have loved, if I had come across it in my middle-grade or high-school years. I’ve put it on my TBR list. At least it is still in print! I devoured pretty much every book written by Monica Hughes when I was a kid. My favourites were the Isis books, Devil on my Back, Invitation to the Game, and Sandwriter (I read all of these multiple times). If you’re looking for another Canadian author who has kind of the same vibe, Janet McNaughton is great (so is her website- the first page is a big picture of her harvesting seaweed). I would absolutely recommend An Earthly Knight (excellent Tam Lin retelling) and The Secret Under My Skin (about a girl in the future who works harvesting garbage dumps and discovers that she has a microchip in her arm). Wow! I’m going to have to look for this one. But that cover is scary. Boy do I love this book. You know my favorite thing? It is a big kick in the face to modern YA in that all of the heroines have to be pretty to be compelling (usually they describe themselves as plain but no one else thinks they are, with the exception of any Mean Girls). I desperately wanted to mention the covers when the radar was posted, but I didn’t want to accidentally cause the massive spoilers. I was lucky enough to find this in middle school, and love it still. Yes! I totally read this series when I was a kid! I also loved Hughes’ Devil on My Back… Maybe I should revisit them one of these days. Yes! I totally read this series when I was a kid, and really enjoyed it. I also loved Hughes’ Devil on My Back… Maybe I should revisit them one of these days. LOVE the idea of reviewing the “old” books – many gems to be discovered in the past LOL! I was in a slump, so when I saw the cover of this one on your original post about it, I put our library’s only copy (large-print, adult SF, go fig) on hold. It came and I ate it up and oh, jeez Louise, am I in love in it! I can’t believe that I’d never read it before or even heard of it. Living the dream of Old-School Wednesdays, you guys. Living the dream.